The Meadow Run Trail has many geological features that create the back drop for its beauty. 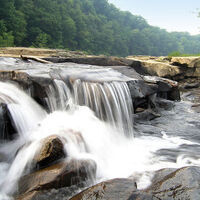 From large rock formations to water falls to majestic hemlocks, this trail is a must. The loop is about a 1.5 miles long. Please wear sturdy shoes.